1. Preheat the oven to 220˚C, gas mark 8. In a large bowl, rub the butter into the flour until it resembles fine breadcrumbs (or whizz in a food processor), then add the salt and a good grind of black pepper. Mix in the milk with a cutlery knife until the dough starts to come together, then crumble in the goats’ cheese and most of the basil. 2. Knead the dough briefly, until smooth; don’t overwork it. On a lightly floured surface, roll the dough out to 2cm-thick, then cut out 12 scones using a 7cm pastry cutter; transfer to a parchment-lined baking tray. 3. Brush the tops with a little milk and bake for 15-18 minutes, until golden and risen; allow to cool on a wire rack. 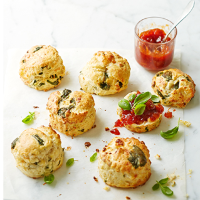 Serve the scones warm, with a spoonful of peach chutney and topped with the reserved basil leaves, if liked, or simply spread with salted butter.